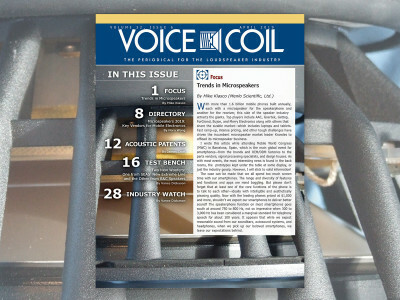 Voice Coil January 2019 is Here and Ready for Another Year! 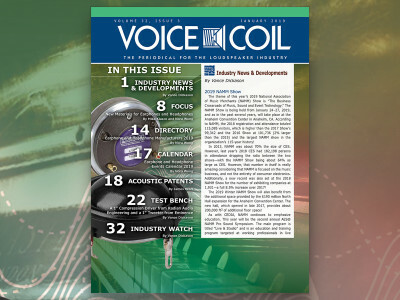 Voice Coil January 2019 is now available. 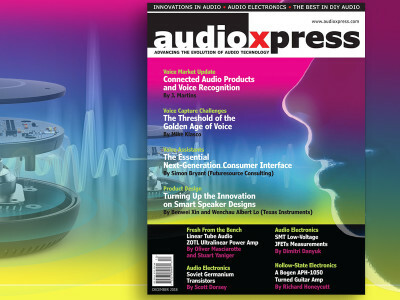 This edition focuses on New Materials for Earphones and Headphones and also includes a valuable listing of Earphone and Headphone Manufacturers and a schedule of headphone-centric events for the year. 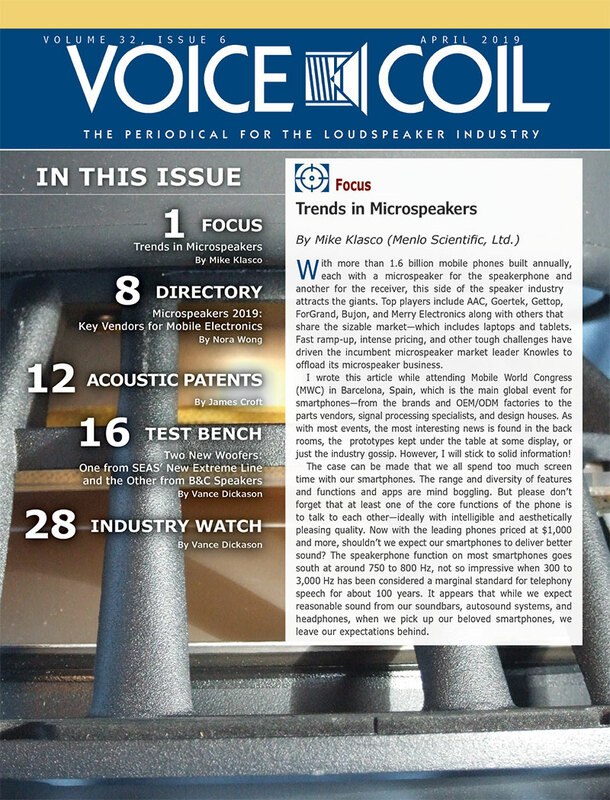 In Acoustic Patents, James Croft looks at a new patent of a multilayer voice coil plate and flat speaker based on the same, while in this month's Test Bench Vance Dickason features a 1" compression driver from Radian Audio Engineering, and a 1" soft dome tweeter from Eminence. 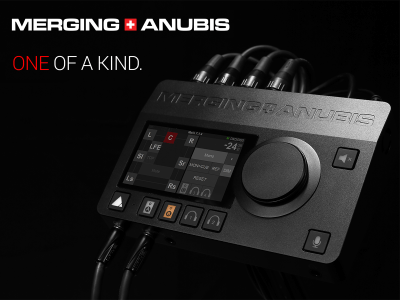 This is much more, now available in print and download. 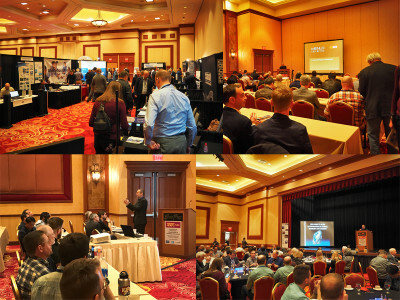 Remembering AISE 2018 - The Last One Before CES! 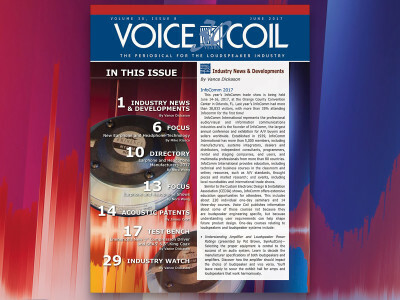 With InfoComm 2018 already behind us, it's time to look forward, when the very first edition of the Association of Loudspeaker Manufacturing & Acoustics International (ALMA International) Symposium & Expo (AISE 2019), will take place June 9 & 10, 2019, at the Double Tree by Hilton Universal, concurrent with InfoComm 2019, which will be held June 8-14, 2019, at the Orange County Convention Center in Orlando, Florida. 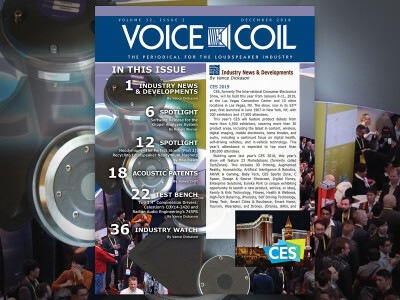 Precisely because of that, we thought it would be fit to properly remember AISE 2018, the last edition which was held this year for the last time in Las Vegas, just before CES. 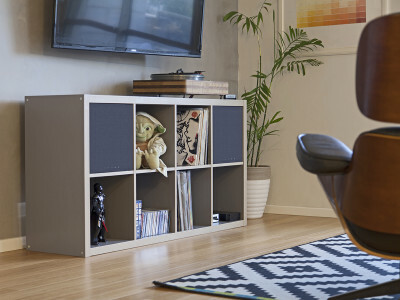 Even is reinventing personal audio with technology that tunes sound to each listener’s unique hearing with its patent-pending Even EarPrint process. 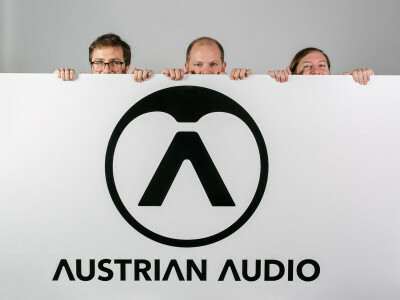 A veteran group of sound designers, acoustic engineers, mastering technicians, and audiologists have perfected a personalization process for headphones and earphones that measures the user’s reactions to a series of eight different frequencies in each ear in only 90 seconds. 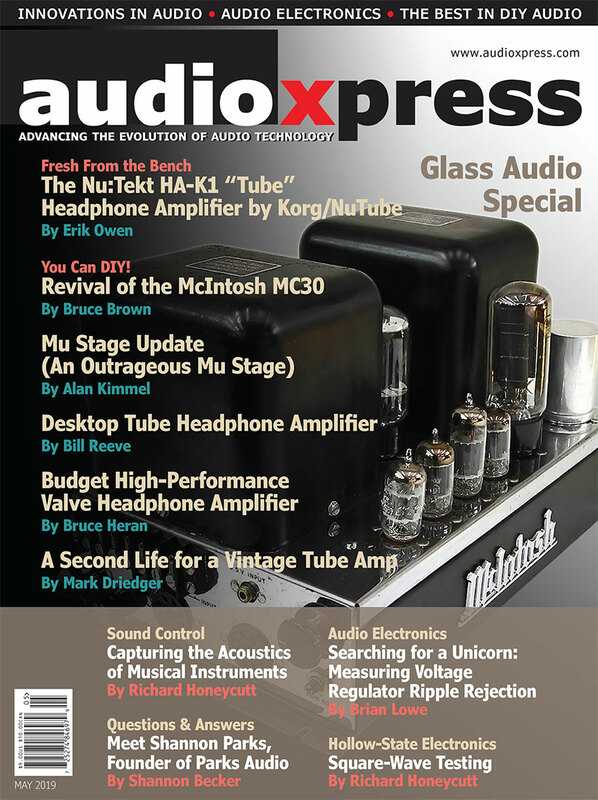 This article was originally published in audioXpress, June 2017. 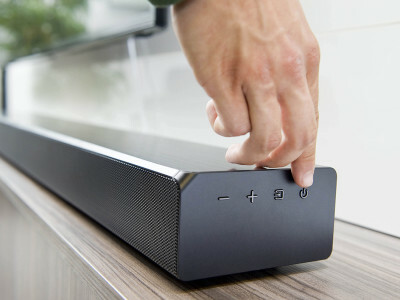 Today, most audio products, from Bluetooth speakers to appliances with voice command, now contain at least one microphone. 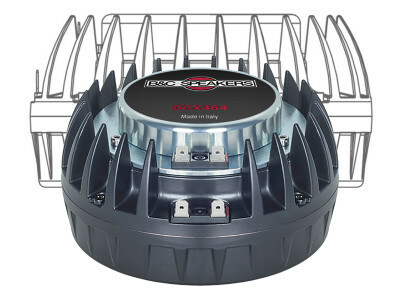 If the product was designed a couple of years ago, it had an electret condenser microphone (ECM), but today it will most likely use a MicroElectrical-Mechanical System (MEMS) microphone. 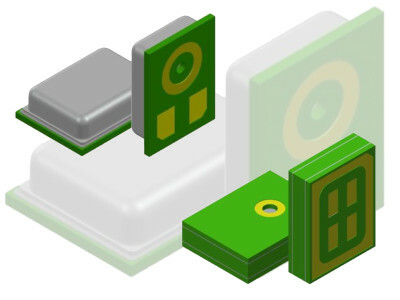 Spec’ing MEMS microphones has some differences and this article touches upon these points. Ropes USA are a colorful special edition of ROAM’s first product, the Ropes Bluetooth earphones, now successfully funded on Kickstarter with a $100,000 goal. 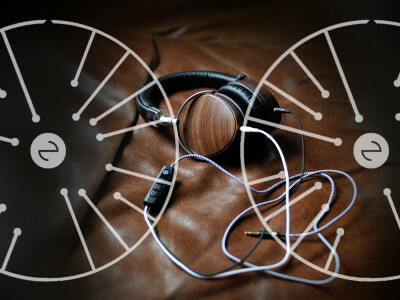 Ropes’ design is somewhat reminiscent of Beats earphones and that’s probably the intention because ROAM is a company founded by Steven Lamar, an entrepreneur with a history related to Beats’ origins. 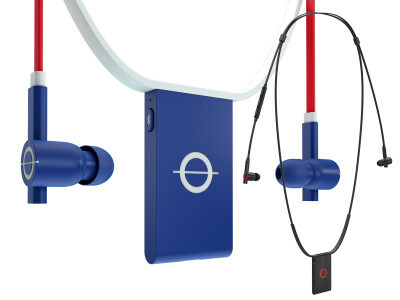 The Ropes Bluetooth earphones also remind us of how early Bluetooth products looked back in 2010.